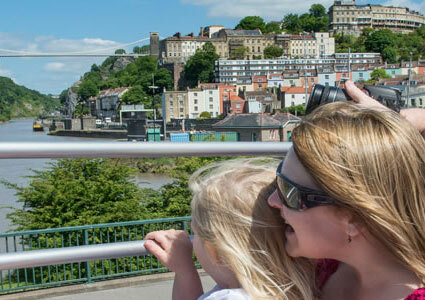 We love Bristol and it’s a great pleasure to show you around our wonderful city! 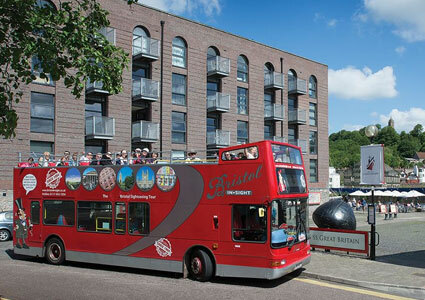 Hop-on one of our buses to sample the best that Bristol has to offer on our 75 minute fully guided tour. Sit back as we show you the delights of Isambard Kingdom Brunel’s famous works, breath-taking architecture, amazing shopping experiences, awesome green spaces and the laid back vibe of the historic harbourside — to name but a few! Make sure to “hop-on and off” as often as you like so that you can fully explore this vibrant and diverse city. Oh, and don’t forget to hang on to your tickets for some great discounts available around our route. Want the freedom of having your own bus? A private hire is a great entertainment solution for larger groups. Fantastic for special occasions, school groups, weddings, conference and delegate entertainment, proms ..... and much more! Get in touch and see how we can help. We welcome all well-behaved dogs! We particularly welcome guide dogs, as The Guide Dogs for the Blind Association is our chosen charity for 2013. Groups of 11 or more people can receive a group discount if they pay the driver in one single transaction (Adult and Concession tickets only. Combo tickets not included). One group member goes free per 10 people in the group. Payment may be made by cash, or by cheque made payable to ‘Rubicon Classic Enterprise Ltd’. Children aged 5 to 15 years travel for just £8. Students in possession of full-time education passes may travel at the concessionary rate. Sorry, but we are not part of the national free travel scheme. However we do offer an OAP concessionary rate. You can buy your tickets ("Explorer" or "Bus/Boat Combo") from our website or the driver. Tickets can also be purchased from the Tourist Information Centre. We accept cash and on-line payments only. Groups of 10 or more people may pay by cheque, made payable to ‘Rubicon Classic Enterprise Ltd’. Food and drink are allowed but we kindly ask that you respect your fellow travellers by using the bins on the lower deck for all your litter. We ask that food types be kept to "snacks" such as sandwiches and chocolate. Alcohol is strictly forbidden. We do not have toilets in our buses. However, there are many public toilets along our route and in the city centre. We do not have seatbelts installed in any of our buses. This is in line with current legislation, which states that buses are not required to have them.